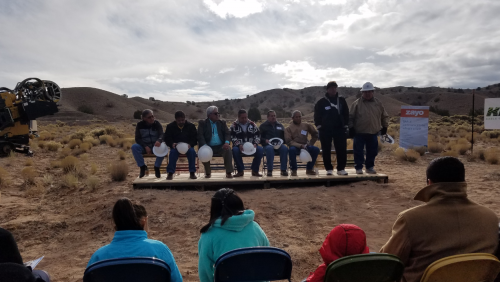 This Monday, December 18, 2017, the Middle Rio Grande Pueblo Tribal Consortium broke ground on a multi-tribal collaboration to install fiber optic broadband cable to four pueblos. The four tribes, Cochiti, San Felipe, Santa Ana, and Santo Domingo, formed a consortium, applying for and winning a $3.9 million dollar E-rate award to fund the project. This significant award was the largest E-Rate award in New Mexico in 2016, and nationally, it is a historic first for tribal nations. AMERIND Risk supported project development and preparation of the E-Rate application. The result will be a 60-mile fiber optic network, that will increase internet speeds to over 100 mbps; speeds will increase by 350%, while costs will be less than 10% of what they currently are. 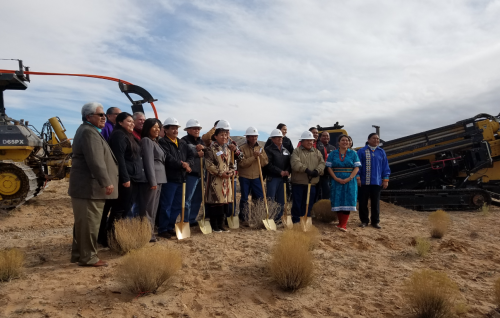 Congratulations to the Pueblo de Cochiti Library, Pueblo of San Felipe Community Library, Santo Domingo Pubelo Community Library, and the Santa Ana Pueblo Community Library – and to all the tribal governors, leaders, and those at AMERIND Risk who worked to bring this project together! And a special congratulations to Kimball Sekaquaptewa who worked so hard on this project.